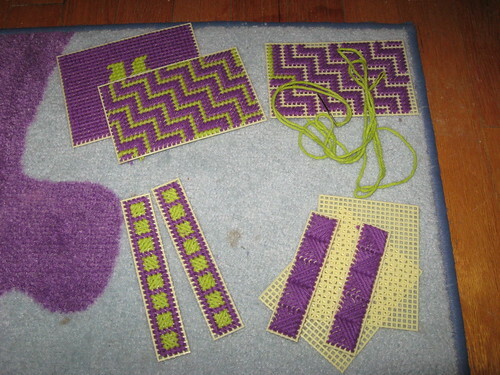 Still Needlin’ Along, originally uploaded by Craftydiddl. Only two more sides to go and then some seaming and the Big Reveal. So far this has been a fun project-and that’s what i wanted-some simple new fun and hopefully a ccool product at the end of it all and if not that’s okay too. I also worked on inch on my socks. And that’s all-this stitching stuff is fun but slow going. And what great way to get to take a break from regular knitting but still using yarn. That’s so pretty. I love purple and green. But what is it going to be? ?